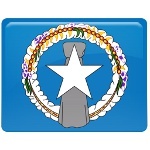 December 8 is Constitution Day in the Northern Mariana Islands. Interestingly, it coincides with the feast day of Our Lady of Camarin, the patron saint of the archipelago. The Commonwealth of the Northern Mariana Islands is one of the two United States territories with “Commonwealth” status, the other being Puerto Rico. The archipelago was initially colonized by Spain. In 1898, Spain ceded the Northern Marianas to Germany. After Germany's defeat in WWI the islands were administered by Japan. Near the end of WWII, the Northern Marianas were invaded by the U.S. military. After Japan's capitulation the islands were administered by the USA as part of the UN Trust Territory of the Pacific Islands. In the 1970s, the islanders decided to forge closer links with the USA. A covenant to establish a commonwealth in the political union with the USA was approved in 1975. The development of the constitution of the commonwealth began in 1976. The new constitution was approved by 96% of voters in a referendum held in 1977 and came into full force and effect on January 9, 1978. It has been amended several times, last in 2012. As it is the constitution of a Federal territory of the United States, the Congress has the right to alter, abolish or mandate amendments to it.